"You guys are fabulous at what you do and we appreciate your professionalism and talent. Dane and Carl, thank you so much for being so patient with us and answering all our questions and even coming out to the house just to help put our minds at ease about the process. " Rugs give a facelift to an otherwise drab interior. It is rewarding to purchase great handmade area rugs, but the entire purchasing process can be pretty daunting. The tips below will help make rug buying easy and enjoyable. What Does an Excellent Rug Looks Like? Hand-made products are never 100% perfect because man is prone to error. However, the best area rugs should easily lie straight and flat on the floor. They should also be regularly shaped. The rug wool should be lustrous and lively with balanced coloring. Check closely for signs of early fading before you make a purchase. The finishes of the rugs should have an intelligent touch. Unnatural brightness and shiny finish indicate a bad rug. You should be able to detect the artisan skills just from a single look at the rug. Do you need a high quality rug? The initial step you should take before making a rug purchase is to look for trusted area rug dealers. Our sales representatives are carefully trained and have decades of experience selling area rugs and flooring. Before buying a rug, measure the length and width of the area that will be covered by the rug. Leave some room for a flooring border around the room. The spacing will allow for a greater size range, thus giving you numerous choices. Do you love traditional rugs or are you more inclined to contemporary designs? To effectively meet your needs, consider hiring an interior designer. You can find area rugs that range in varied densities – up to 30 knots make up the coarse rugs. Extremely fine mats are made up of nearly 300 knots per square inch. Just like TV pixels, concentrated knots allows for neutrality in the looks of an area rug. Also, lights reflect better on fine knots than the coarse knots. Line curves appear graceful on a multi-knot fine mat. Which wool is better? Hand-Spun or Machine-Spun? Machine spun wool is technically better than handspun. However, hand-spinning is an art highly valued by both collectors and connoisseurs. The effect seen in hand-spun wools can be stunning. The coloring of the area rug can be varied depending on how tight or how loose the yarn is spun. Never judge the quality of an area rug by the pile height. It is common for inexperienced buyers to mistake quality for the thickness of the pile. Our skilled team are of experts are here to help you make the perfect rug that will brighten your room for years to come. 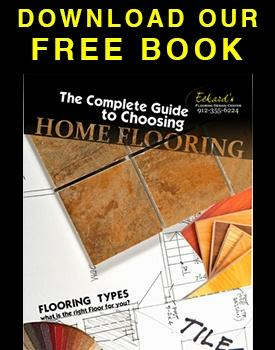 Eckards Flooring is a family owned business with over 50 years of in the flooring and home decor business. Come by today and see how we can help you make your house feel even more like home.